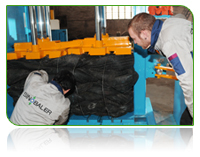 Our team consists of experienced waste recycling engineers in hydraulic and mechanical fields who have been pacing with advanced technologies and focus on the designing and manufacturing of the world-class baling machines. We think outside of the box and always try to provide each customer with optimal baling solutions for his needs. We deliver what we promise on time. In our workshops, only workers with vocational qualification certificates can take charge of special work like welding, machining and painting. They are regularly trained and tested for the skills required by the waste recycling work they are entitled. 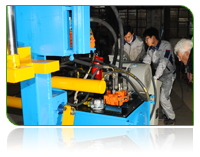 Safety operation is our main concern and we do everything to protect our workers from work accidents. They are required to equip themselves with essential protection devices during the whole waste recycling process. Our complete facilities ensure that the whole production process could be accomplished in-house and meet the high manufacturing standard.